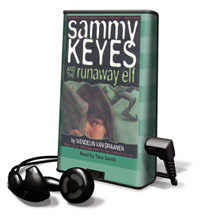 Sammy Keyes tries to help out a friend and ends up in a mystery that must be solved or she could lose her home in the book by Wendelin Van Draanen. A prize dog is missing and its owner, who blackmails most of the town, forces Sammy to find the dog. At the same time, Sammy must find out why a little girl keeps running away, discover what happened in her grandmother's nosy neighbor that turned her into a mean old woman, and find a way to get even with her school enemy, Heather. Even with this many subplots, the action moves clearly and swiftly, with each tying into the main lesson of the story forgiveness is as good for the forgiver as for the forgiven. This is the fourth adventure in the series, but stands well on its own. Sammy is a strong heroine who has a hard life. The narrator, actress Tara Sands, gives all the characters their own voices, and makes it seem like 13-year-old Sammy is telling the story. A good choice for libraries looking for mysteries for middle school girls.